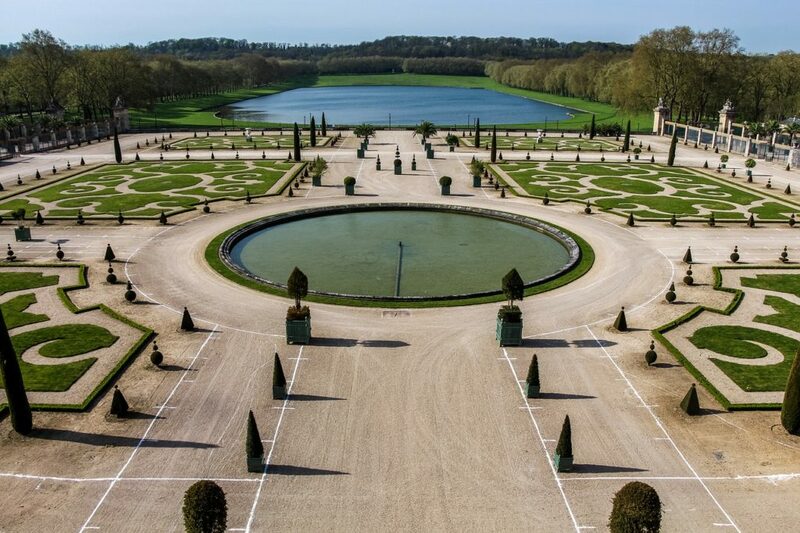 The epitome of classic French garden design at Versailles. The classic French garden invokes images of bright lavender, ordered gravel paths, calm reflecting pools, symmetrical planting beds of boxwoods and shrubs—maybe a stone bench waiting for someone to rest on it. The Old World charm of French gardens fits beautifully with classic country homes and chateaus or today’s modern styles. Designing gardens in the French style is going to be different from other types of landscape design but it is surely influenced by other styles. French garden design closely borrow from Italian landscapes with their similar themes of symmetry. Moroccan courtyard gardens reflect the need for cooling elements and protection from the elements. Many French gardens include a water feature. Mediterranean gardens almost always contain terracotta pottery while French gardens use classic wood planter boxes or Anduze vases. English gardens with their exuberance for abundance and flowers are the inverse of the cooler color palette of French garden design but share a love for native elements. All these developments influenced each other to give us the classic French garden. Chalk lines mark the planning stages for this large formal French garden. Below are the basics that most French gardens incorporate, and we will discuss them in detail as you consider this style in your own landscape. Above all else, symmetry and geometry are the main hallmarks of French gardens, imposing order over nature. The epitome of this mathematic approach are the gardens at the Palace of Versailles. 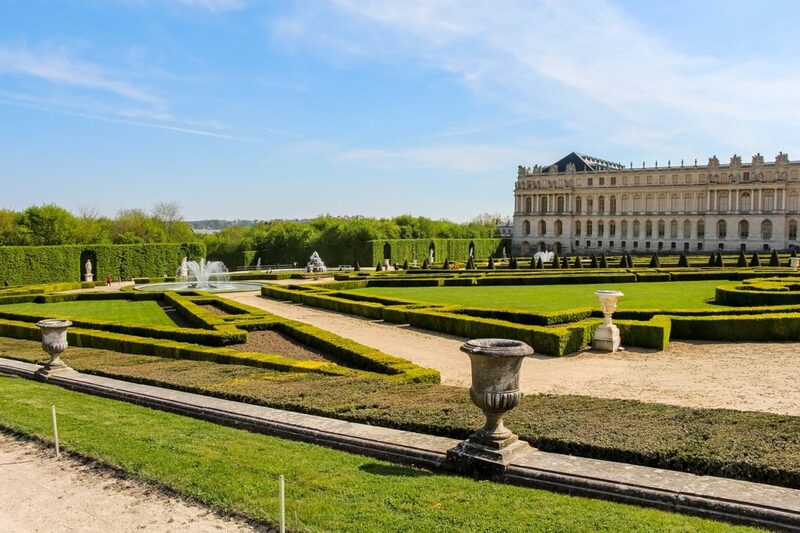 This is the best in formal French garden design and easily recognizable with its symmetrical gravel paths, Versailles citrus planters, ordered groves and neat topiary, and principle axis from which the design flows. All French gardens have a little Versailles in them. The design is all about perspective because French gardens are meant to be viewed from all angles, even above from a terrace or window of a chateau. Many famous French gardens, like the one at Chateau de Villandry, are overlooked by the main property. 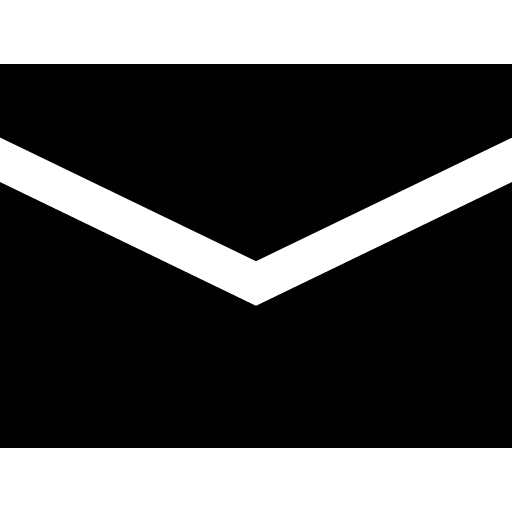 The principal axis is crossed by one or more perpendicular perspectives and alleys. The eye is always drawn to a central feature whether a pool of water, a chateau, even a statue. There’s a saying that there is a place for everything and everything in its place. French gardens are the neat and tidy students of garden design. The main plan is to create an overall sense of order and control. From there, the ground level does the bulk of the work creating elaborate parterres, or planting beds. 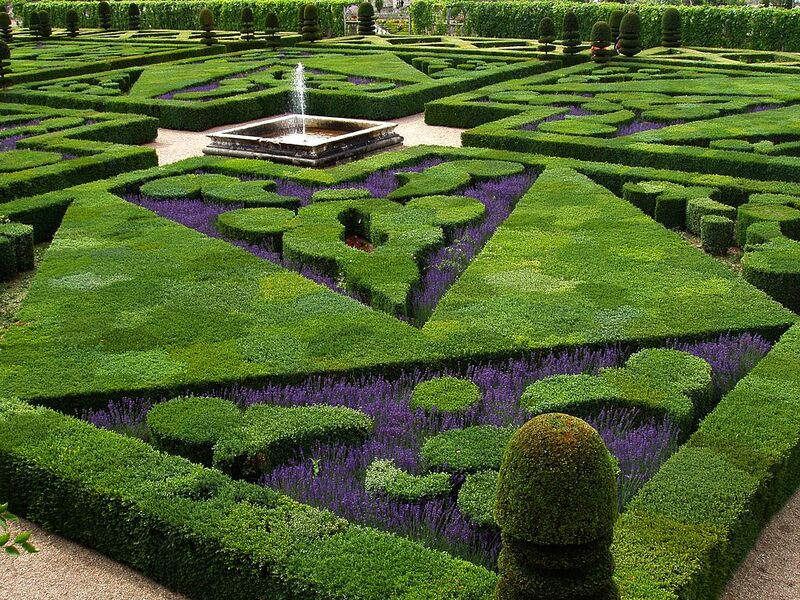 These parterres are the most easily recognizable aspect of French garden design. Often in the shape of elegant squares, ovals, circles, or scrolls, these patterned planting beds complement not just the design, but can be seen from the main house or building. They are usually edged with low boxwood or other shrubbery that help define space and keep edges neat. Planting beds tend to be more complex closer to the main structure, filled with artfully designed boxwood because they can be easily seen from the main structure or terrace. Farther out, the planting beds become simpler, usually enclosing grass or a water feature. Whether small or expansive, immaculate lawns continue the theme of ordered nature and create a nice balance against more elegant and intricate details. Lawns are often rectangular or square, creating lines of interest across the axis and define sections of the garden. Pathways, often made of gravel, border garden elements like lawns and create avenues to travel throughout the design. French gardens usually incorporate a cool color palette that emphasizes greens and whites—think boxwood and stone gravel pathways. Rows of lavender bring in purple and reflecting pools the cool blues. Because ornamental flowers were rare in France in the 17th century, the color palette was limited. Trees, bushes, and topiary had to stand out in other ways, so they were trimmed in geometric forms. For décor, the greys and blues of an iron bench, pergola, or trellis reinforce the cool color scheme. Introducing water features like reflecting ponds, pools and fountains plays up the geometric patterns as they are often in circular or rectangular shapes. Neatly trimmed boxwood and hedges in bright green. The dark purple of the lavender continues the cool color palette. Whether seen in gravel paths, statuary, or terraces, stone is an easy element to incorporate into a French garden design. It provides balance against the plantings and underpinnings to the entire design. Planting beds can even be edged with stone. Pathways enforce order by controlling the route of a visitor to the garden and continues the aspect of geometry with straight lines across and perpendicular to the axis. Stone garden elements like statues, columns, or follies also provide points of interest throughout the garden design. They are often the central feature of enclosed groves or mark intersections on pathways. They can also line pathways, interspersing trees and plants in a repetitive and ordered pattern. Sculpture and statuary in classic French style are of mythological figures like cherubs, nymphs, goddesses, and warriors. Gravel pathways, stone planters and statuary, as well as stone edgings that run along hedges. Stone is also used for more than decorative elements and often makes up the all-important terrace where one can enjoy the view of the whole design. Stone can also border boxwoods and planter beds. When incorporating water elements, stone coping encloses pools and fountains. The hallmarks of a French garden can be seen in more formal and strict gardens like the grand ones at Versailles or as simple as a potager, or kitchen garden. Planting beds are sectioned off for specific herbs and plants meant for cooking. Potagers are more practical, but their design borrows from the rich tradition of French formal gardens. Upkeep will require regular maintenance for any garden using this style. Provencal style gardens overflow with color and have a charming wildness to them, but also incorporate the same elements of stone, boxwood, and water features. Precise care and control are required for traditional French design, but the results are fantastic. French garden design continues to attract garden lovers and inspire gardens all around the world. Creative Commons. CCo Creative Commons. Pixabay. Creative Commons, French Formal Garden in Loire Valley by Aernoudts jean is licensed under CC BY 3.0.